I was born in Detroit Michigan but soon returned with my parents to their home in Phelps, Kentucky, a small coal mining community tucked away deep in the Appalachian Mountains in Pike County. 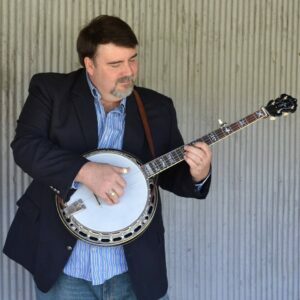 I began playing the banjo at about the age of 9 when my grandfather, Charles Everett Dotson, purchased an inexpensive banjo from Sears in Williamson, West Virginia and taught me to play my first tune in a minstrel style. That tune, John Henry, changed my idea of recreation forever. Most of my free weekends during my teens, and most free weekdays during summer breaks from Phelps High School were spent in the home of my nearby neighbor, Carl Dotson, for whom my first book will be dedicated, and his wife, Gertrude, immersing myself in the music I had fallen so deeply in love with. The invaluable lessons learned during these influential years spent jamming and playing along with old-time, Gospel and Bluegrass songs with Carl and Gertrude and my childhood musical friend, James (Jimbo) Compton on guitar set the stage for me. Other local musicians like Dean Jackson of Hurley, Virginia, a superb guitar player and singer in the area, kept my attention and allowed me exposure to some of the best pickin’ available in the tri-state area. I began playing with a local Bluegrass Gospel band, Larry Fuller (1948-2007) and the Born Again at the age of fifteen where I spent about 3 years recording and playing on a regional level in churches, radio and television shows and the occasional Bluegrass festival until my enlistment into the United States Navy in 1985. After my 4-year obligation expired I eventually settled down in the Richmond area of Virginia where I teach banjo, guitar and mandolin as well as build and repair banjos and other stringed, acoustic and electric instruments in my home workshop. I own and personally maintain the webpage you are currently browsing. My loving wife Jeanne and I have four children and one grandchild. Our home is full of love, music and occasionally chaos and drama. I hope you will say hello if I am performing at an event near you.